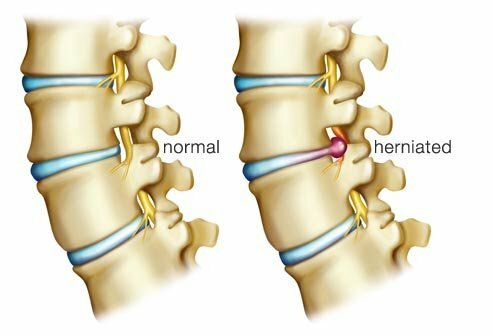 If the discs become damaged in any way, a cycle of pain begins with the start of progressive problems which can culminate in a herniated disc or ruptured disc. 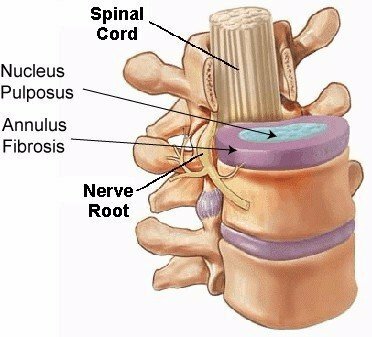 The most important thing to remember is that back pain is usually the result of a structural problem and until the structure of your spine is addressed, the pain will persist. The outer portion of the disc is called the annulus fibrosis and the soft inner structure is called the nucleus pulposus. This structure provides flexibility and cushioning to the spine. It also creates space between the vertebrae so that the delicate spinal nerves can pass through the openings called foramen to reach their target destination. When your disc is injured or torn, the nucleus — the soft jelly like substance inside the disc can leak out. If it leaks out completely, it’s called a herniated disc. If the outer material is not torn, discs can bulge without herniating. It’s like if you step on a balloon and it doesn’t pop. The balloon bulges out to one side or the other without the rubber breaking.